I wanted to share with you another tutorial for sale today. 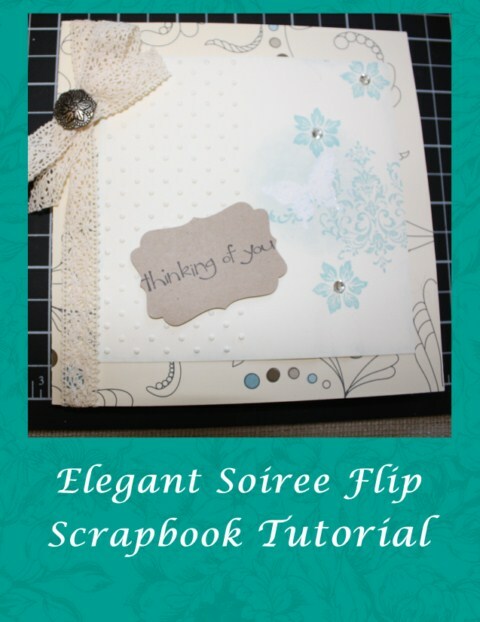 I am really excited about this one as it incorporates scrapbooking but in a portable way. Great for you who like to brag about just about anything. LOL. Or to sit beautifully on your shelf for your friends to go oooohhh and aaahhhhh over. Just on the beauty of the colors and embellishments. This time I have added larger photos with more detail and work. So this is a 17 page, step by step tutorial and only for $4.95. Again it utilizes Stampin' Up! 's Designer Series Paper with a vintage feel. For this month's blog candy I will give away two tutorials to the two lucky folks who leave comments about how they would utilize this tutorial for themselves or their business. I will make the drawing on Friday February 18 @ 8PM MST. The lucky winners will be notified via email that evening. Good Luck!!! Great giveaway! I would use it for personal use as I am always behind on my scrapping!! Looks like it would be simple enough to create on a time schedule. Thanks for the opportunity to win! This would be for personal use. When I take my granddaughters on a trip, one of the things we do when we return is scrapbook the adventure. This year is a big one, high school graduation and we're off to London. Hope I can win it!! Thanks for the chance. I don't do much scrapbooking because I don't know how to get started. So this would be a great way to start and learn so I can teach others. My Young Granddaughters and I do many crafts and the 6 year old keeps a journal (My Daughter Home Schools) and this would be a great way for her to add to her journaling. What a beautiful book. I would use it for personal scrapbooking. I'm way behind in this area. Once I've made one for me, I'd then make one for my daughters. I love it! I would definitely give it to my granddaughter so I can help her scrap our first trip together. We went to Maine and she took LOTS of pictures!